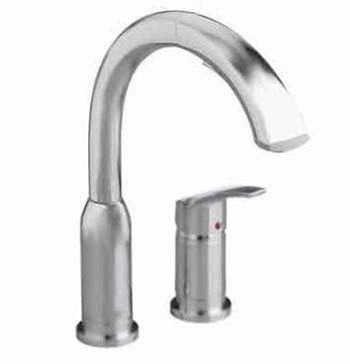 There's a lot to love about this beautiful Arch Pull-out Kitchen Faucet from American Standard. This impeccably designed and architecturally inspired kitchen must-have is from the Arch Faucet Collection and is designed for the ultra-contemporary kitchen. It has a swivel spout, memory position valves, and a pull-out sprayer that makes it handy to fill pots or mop buckets. The faucet's ADA-approved lever handle is integrated into the spout for a clean, modern look that will transform your kitchen sink area into a work of art. With this faucet you also get flawless functionality, good looks, and drip-free, worry-free performance that will make you happy for years to come. As always, this top seller is backed by a limited lifetime warranty on its finish and functionality from American Standard.